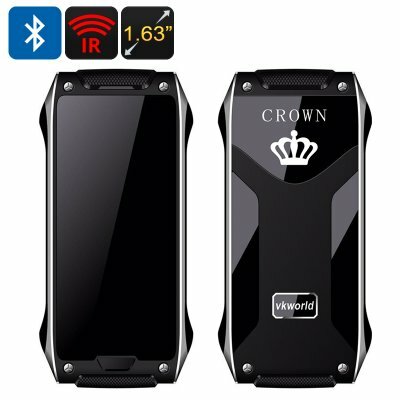 Successfully Added VKWorld CROWN V8 Cell Phone - Thermal Touch, 1.63 Inch OLED Screen, 780mAh Battery, IR Blaster, Bluetooth (Black) to your Shopping Cart. The VKWorld CROWN V8 is the new addition to the VKWorld family and definitely the one of note. This classic Nokia-style device may seem simple at the first glance — but it is a real innovator with a bunch of truly impressive features. You will get to explore thermal touch, play with the built-in IR blaster and more. The VKWorld CROWN V8 is your basic GSM phone — but with lots of extras to offer that take it to a whole another level. The phone is one of the first models to feature thermal touch — an addition that enables a completely new way of interacting with the device. The phone is sturdy and sports a redesigned Corning Gorilla Glass 4 screen which is resistant to various types of damage. The 1.63 inch OLED display will thus serve you long and well. The SC6531D CPU features a low power consumption chipset and will make the phone’s 780mAh last longer. The phone supports two SIM cards and lets you have different numbers and accounts on one device. The VKWorld CROWN V8 works great as a secondary phone. Its Bluetooth functionality makes the phone easily compatible with other devices — like an iPhone or Android phone. You will be able to sync contacts, play music, talk and send messages.